A gentleman must be able to tell what time it is. 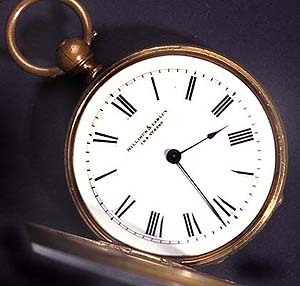 Therefore, a Regency gentleman should carry a watch – a pocket watch or fob watch. The watch is attached to a watch fob, which works like a handle so that the watch can easily be found in the pocket. At this time the watch was concealed in a hidden pocket in the waistband on the trousers or breeches. Remember I sewed a welt pocket into the black silk taffeta breeches? 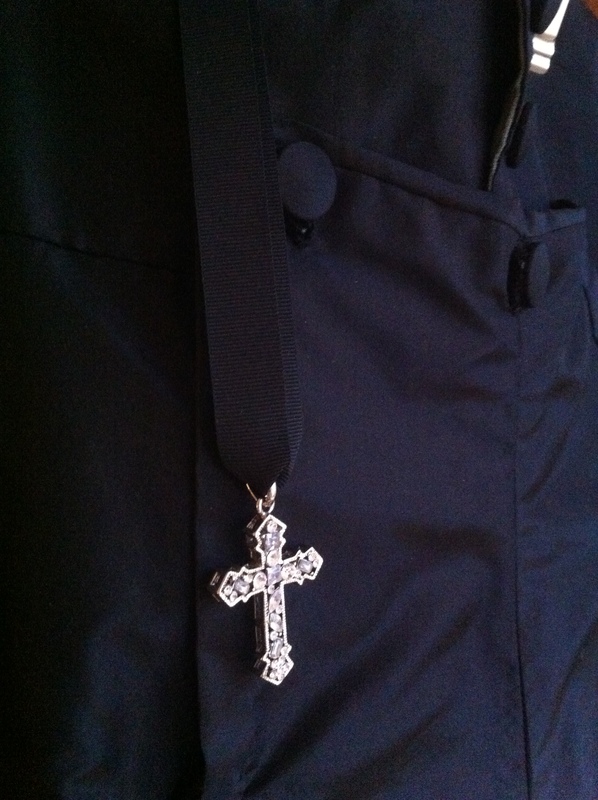 The fob, a chain or made of fabric would be visible, and adorned with a weight of some sort – a perfect way to personalise the outfit and show one´s rank in society, As a clergyman Mr Elton carries a small cross in a black ribbon. Diamonds or glass beads? Perhaps a gift from his dear wife? The Watch could look like this, if I had one. I had no time to find the actual watch so I am simulating it with the help of a key chain that was laying around in our cloak room. I simply attached the ribbon to it with a few stitches and voila! The shirt is finished, at last. I took some time as I decided to handstich it. (It´s historically accurate, but ok I couldn´t use the machine late in the evenenings…) I didn´t use a particular pattern, but based the design and technique on earlier research and experience, and I also found several excellent tutorials online. I can especially recommend The Victorian tailor and Tea in a Teacup. It was not difficult at all, really very straightforward. I know, it´s a lot of work for something that will be hidden under coat, waistcoat and cravat but it helps me to feel more like a Regency-person. Originally I planned to use fine linen or cotton batiste, but ended up using an old linen/cotton blend fabric that once was a sheet. 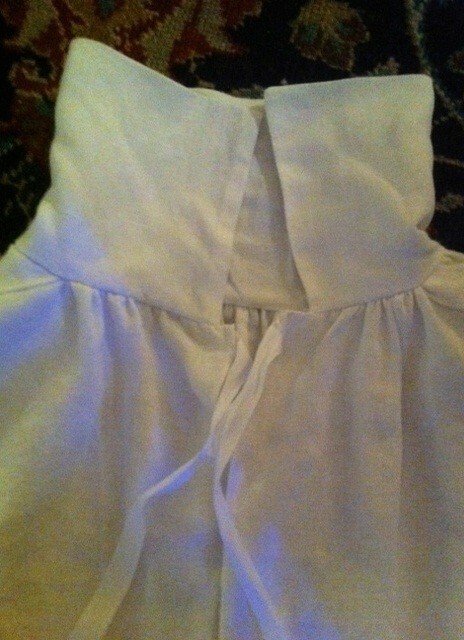 It will do for now, but I´m not entirely happy with the way the shirt turned out. 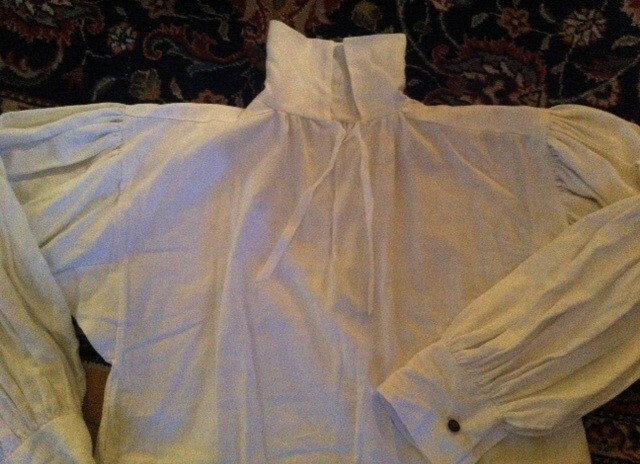 The sleeves are a bit too wide and the gussets could be positioned higher. This causes some unnecessary bulk when worn with the coat. 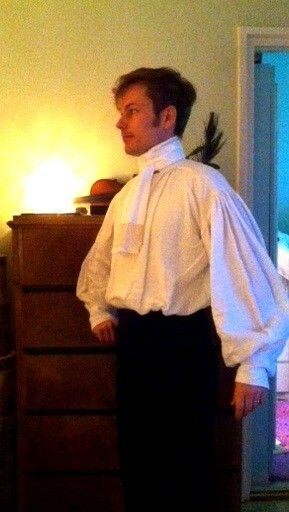 I know that Regency shirts were really wide but then I should have used a lighter fabric. If I´d go for a swim in the nearest pond I´d probably drown 🙂 The cuffs are also slightly too wide whereas the collar could have had one inch more to fit better around my neck. I´ve read different versions (can´t remember where) on how to button the cuff: like a French cuff or overlapping like a modern shirt cuff. I´ll most likely go for the latter. 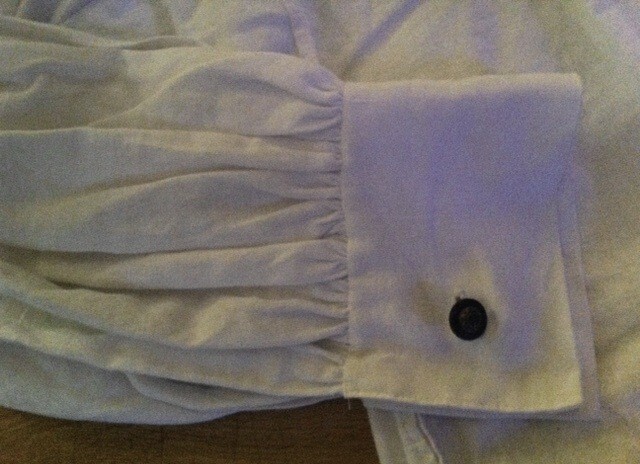 If there is time I might perhaps add a frill to the front opening. I already had the cravat. It is just a length of batiste, hand hemmed with a piece of fine lace at one end. I´ll iron it before the ball, and should starch it also to make it really crispy. There are of course many ways to fold and tie a cravat, depending on a man´s rank and skill of his valet. I prefer to wrap it twice round the neck and tie in front, but perhaps I´ll try something elaborate for the ball! No true gentleman would dream of going to a ball without gloves. 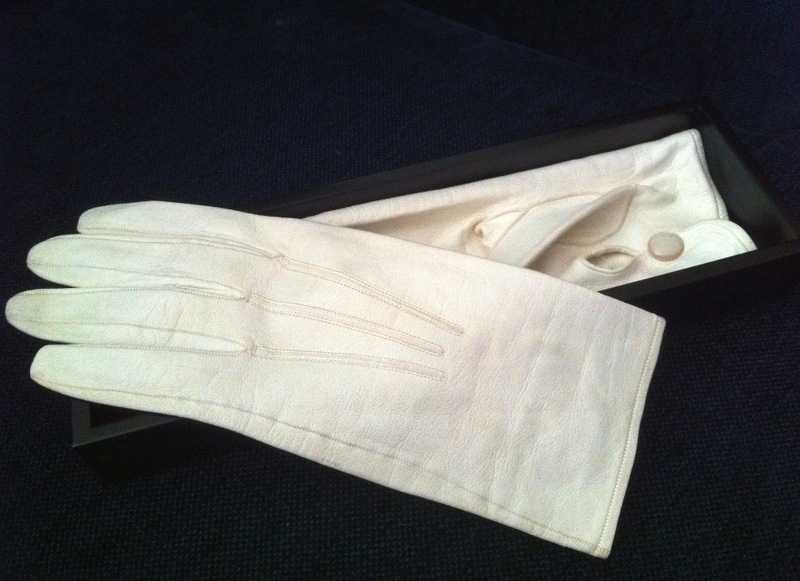 White gloves have always been a status symbol and a sign of breeding. Remember they were handmade by true artisans and therefore expensive. Frank Churchill decides to purchase a pair of gloves at Ford´s in Highbury. By spending money in the leading (only?) store in the village his reputation will be improved considerably. Touching a lady with bare hands when dancing would have been considered as too intimate and definitely a crossing of the comfort zone. Always wear gloves when dancing and shaking hands but remember to remove them when eating hors d´euvres, dinner etc. Earlier this week I biked over to the source of all things precious, rare and reasonably priced: Old Touch vintage shop in Stockholm. There I found these well preserved gentleman´s glacé kidskin gloves for as little as 80 SEK (about 9 euros). 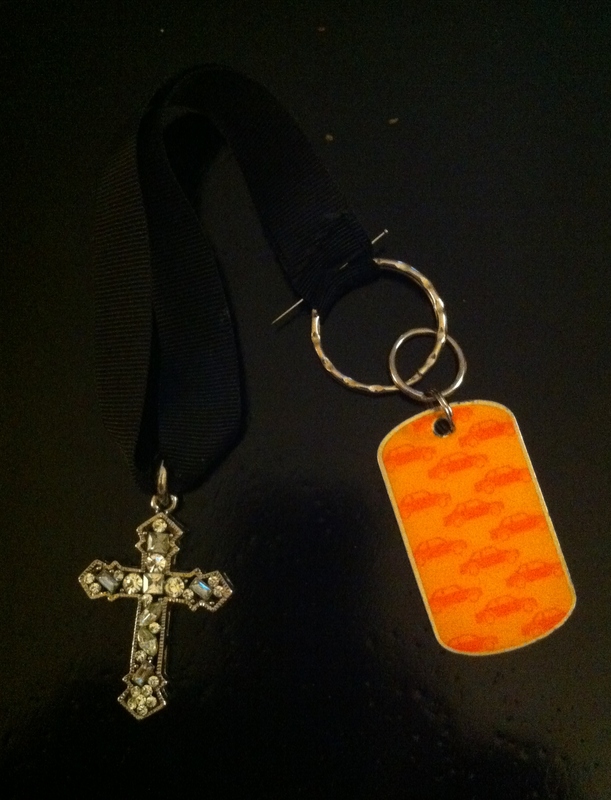 They are not extremely fragile but I put them on carefully. As you see they fit like a second skin. I am not going boxing in these! (As if I would…) Mrs Elton ordered her opera length cotton gloves from Nehelenia Patterns in Germany.